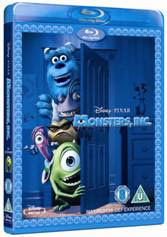 This is the film we were waiting to see on Blu-ray, Monsters Inc - possibly the best children's film of the last 20 years, and definitely our favourite. We've watched it numerous times on DVD, and it's impressive enough - but in Blu-ray, well, it's the perfect film to see in the format. The details on the monsters - particularly Sully's fur, and Mike's skin - is incredible, and the clarity of the picture is good enough for even a philistine like me to notice. When this film was originally released around 2002, my youngest daughter (who by the way, will now be known as Tall Daughter - she's outgrown the Small) was just turning three, and looked like Boo the character in the film. Whenever she saw posters or advertising for Monsters Inc she would always point at Boo and say 'That's me!'. So cute. When we heard that Thinkparents were sending us this film, we couldn't wait for it to arrive and when it did we sat down to watch it straightaway. Needless to say, Monsters Inc scored a full 10 out of 10 from all three of us. 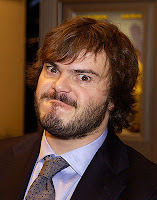 There's something about Jack Black that is very attractive and the more I learn about him the more attractive he becomes. I don't care if he's referred to as 'rotund'. I care less that he is on the short side of tall (5' 7" by all accounts). I don't even mind his penchant for gurning. The thing is, I've always liked his personality ever since I saw him in School of Rock and doing his over-the-top persona in the Tenacious D videos. And then in the film The Holiday with Kate Winslet he was just adorable! He was the sort of boyfriend you dream of - attentive, loving, fun. Ok, OK, I know it was a film role but I can dream can't I? Then, just recently, I saw him on a TV show talking about his children and his wife, and he seemed so grounded and family orientated. I love that in a man. And he's funny too. Oh, yes a funny man could laugh me into bed quite easily. Although I don't want to be laughing at him in bed you understand. But Jack Black's sense of off-the-wall humour appeals to me, and who wouldn't like a man who could make you laugh everyday? But then the coup de grace was when I saw a photo of him in a newspaper last week. He is currently in the UK filming Gulliver's Travels and he was spotted out and about in London pushing one of his children around in a pushchair. OK, that's cute enough but he was photographed getting onto a bus. A bus! Not getting into a limo, or hailing a taxi. 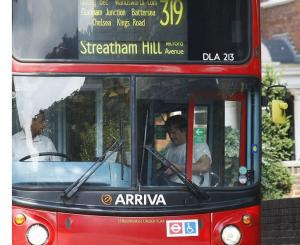 No, Jack was struggling with his boy's pushchair onto a regular London bus. You just gotta love that haven't you? No grandeur for him, just an down-to-earth day out for him and his boy. Jack, just in case you're reading this, do you have any single, older brothers? A previous 'Men You Shouldn't Fancy' post about Eddie Izzard can be seen here. Thank you so much to everyone who left the very kind and thoughtful messages after my last post about my Dad. He is still in hospital, and still frail and ill, but he's hanging on. And if I know him, it's out of sheer stubbornness. My girls have been with me to visit him today and it cheered him up so see them, but they find it very sad to see him as he is. As I said, thanks everyone. You really are a fabulous bunch of bloggers. This has been a busy week. I realise I haven't been blogging and that's a combination of tiredness and my head being full of other 'stuff' that needs attending to. My dear old Dad who has been in poor health for a long time, became even more seriously ill on Monday and was taken into hospital. My sister and I felt he was close to death. It was touch and go for a couple of days, and he's still very ill but stable. 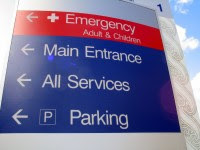 He's going to be in hospital for a while longer and the medical staff have agreed with us that he needs further nursing care, and so will be transferred next week to a local hospital with a rehabilitation ward. Dad is 83, and misses Mum dreadfully. He told me this week that he'd 'had enough now' and wants to see her again. I feel strangely calm that this might happen quite soon. My lovely girls arrived home and is was so wonderful to see them again. We've enjoyed our time together this week and have taken the lovely Tess out to various places for long, long walks. Walking Tess together is a great family activity, where we can talk without the interruption of 'phones and TV. So this has been a week for family. The good and not so good. The happy and the sad. The old and the young. I'm happy to embrace it all, and to deal with what happens when it happens. Why is it that whenever I want to cook fried eggs I always manage to break the yolk, but when I'm doing scrambled eggs the yolks are always intact? This one has been bothering me for years: What on earth does the Queen have in her handbag on Remembrance Day? Whatever it is, it must be important because she doesn't let go of once, not even when she's laying the wreath of poppies. I'm guessing it's her Lotto slip, and a packet of Woodbines. No? Why do your lovely, sweet children turn into seething teenagers just as you are becoming menopausal? Teenager tantrums and menopausal symptoms are not my combination of choice. Why would Mother Nature play such a cruel trick? And another thing, why is it that when you are driving behind a slow moving/erratically driven/unsure driver it almost always turns out to be a 'mature' man wearing a hat? Ever noticed that? Why are they always wearing hats? And don't get me started on my hair! Why does it always look fantastic just before a hair appointment? After a few Bad Hair Weeks your hair colludes to look good just before you have to pay out dosh to have it redone. Pah! OK, rant over. Thanks for listening, it's good to get things off my chest. Feel free to rant away in return, I promise to listen patiently and agree with everything you say. I make no apologies for writing about my beautiful greyhound dog, Tess. She's only been here for a week and she has melted my heart. What a gorgeous dog, with a wonderfully placid and friendly temperament. When I was thinking of adopting a retired racing greyhound I was told by the rescue centre that when the dog initially came home it would be very confused and probably quite stressed. Most of these dogs, Tess included, are not used to living in a family home or indeed without other dogs so it can take them some time to settle in. The first few days with Tess were spent making sure she was OK, and getting her into her new routine. The first night she was with us she settled down to sleep really well, but on the second night she wasn't happy and started to howl although she did settle after a little while. Tess in her favourite sleeping position, with her head on the floor! Since the third night she has been fine, and now she knows that when I lock the front door and start turning the lights off that it's bedtime, and she goes straight to her bed. What a little sweetie. And we're beginning to understand one another a little better, I understand some of her signals that she wants to go out and she understands when I tell her 'NO' or 'stay'. She has started being a little playful, loves running around the garden and likes to have her ears rubbed. She's such a lovely, gentle dog and my girls absolutely love her (although they're now away on holiday with their dad so I have Tess all to myself at the moment). A couple of days ago I was in the garden repotting some plants and tidying the patio area and Tess was lying nearby on the grass, basking in the sun. It gave me a really warm and fuzzy feeling, and now I understand what Imogen - who keeps whippets - means when she says that happiness is a warm dog. She's so right, and I'm so pleased! If you are thinking of getting a dog, why not consider a greyhound - they make perfect family pets and there are hundreds of them waiting to be rehomed. Contact the Retired Greyhound Trust. I've just had the strangest conversation. I've just been to visit my old Dad, and while I was there his neighbour, Brenda, dropped in for a chat and a cuppa. Now, Brenda is a lovely, lovely lady and Dad always enjoys a visit from her, but it has to be said that she is not the sharpest knife in the drawer. We got onto the subject of holidays and I mentioned that we had just been to Wales for a week. Brenda: Oh, is that the same Wales I go to? Me: Yes....I imagine it is. Brenda: I go to North Wales, but what I can't understand is why South Wales is such a long way from it. Me: Erm....well, yes because it's in the south. Brenda: Is Cardiff in South Wales? Brenda: Y'see, that's what I don't understand, because Cardiff is next to London isn't it? Me: Erm....no, it's not, it's in south Wales. Brenda: But London's in the south too, so they must be close to each other. God love her, she was a trifle confused about the geography of the British Isles, but after a quick sketch and a few labels I think she got it. Then she asked me where my girls where. Me: Oh, they've just gone to France with their Dad for two weeks. Brenda: France...is that next to Wales? I kid you not. I came away feeling amused but incredulous at how someone can be so unaware of their country and continent. Unbelievable. PS. I have included a map for any non-UK readers of my blog, who may not be familiar with the geography, and not to insult anyone's intelligence! I live in North West England. 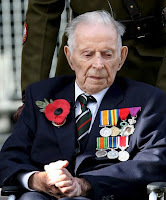 Harry Patch, our final WWI veteran, was laid to rest today after passing away at the age of 111. 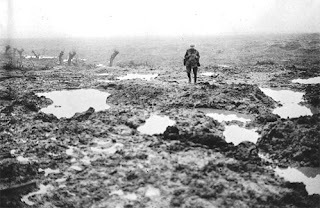 His death means that WWI has passed from living memory into history, and the last person to talk of the horrors of Passchendaele et al can speak of it no more. Harry didn't talk of his experiences in the trenches until he was 100 when he realised that he was one of the few remaining people who could. 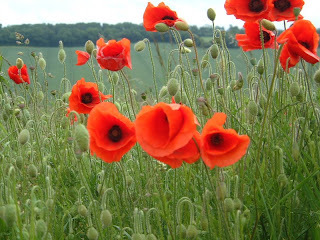 He said of that experience: "War is organised murder, and nothing else. At the end, the peace was settled round a table, so why the hell couldn't they do that at the start without losing millions of men?" As befits a man of peace, his final gesture was to have representatives of the German, French and Belgian armies in attendance at his funeral, but requested that no military firearms should be displayed. Rest in peace Harry, rest in peace. As you may know, after years of my two daughters begging me for a dog we finally brought our lovely Tess home on Sunday and she's already stolen our hearts. So what did I discover today? My girls, sitting in the living room playing on their Nintendo DS players. Guess which game they were playing? Nintendogs. Yep, bloomin' NintenDOGS! This is a game where they can play with a virtual dog, and take it for walks, etc. Their own real dog was sitting in the same room as them. I give up. Well, we've done it. We are now proud dog owners and it's so exciting! Say hello to our gorgeous girl, Tess, who is a big softie and loves to be fussed over. It's only our first day with her and we haven't got a clue what she'll do when we go to bed tonight, but I'm prepared for so me adjustment on both sides - ours and hers. So far today I've taken her for two walks, one for 20 minutes and the other for 40 minutes. I'll be taking her out again later before bedtime - I think all this walking will be great for me! It must be a huge shock for her to be taken to someone's home - she has only ever known the racing kennels and then the rescue centre. I'm hoping she will settle down in time and get used to us and her new home. For our part, we're so happy to have her.